Embark on a luxury catamaran cruise adventure out of Ocho Rios, Jamaica that takes adventure to new heights. Standing on the dock, I pause a moment to let my gaze travel slowly upwards at the gleaming catamaran floating before me. Rocking gently in the calm Caribbean Sea, the beautiful double decker Calipsoul seems familiar and yet exciting and new to me all at the same time. I had chosen Island Routes Catamaran Dunn’s River Cruise the last time I was in Ocho Rios, Jamaica. It had been the perfect combination of relaxation and excitement that I had been looking for. We had also done the romantic Lovers Rock evening cruise, literally sailing into the sunset together. Both times it had turned out exactly as promised, and, this time around when I knew I was heading back to Jamaica, I reached out to the wonderfully helpful Island Routes team yet again. I spoke with them about how much I had enjoyed the last catamaran excursion I did with them and shared that this time I would be coming with a group of friends and family of all ages. 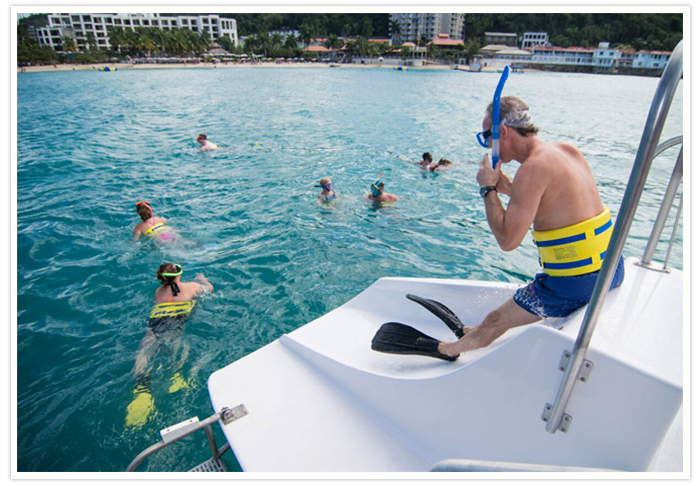 I had enjoyed the snorkeling aspect of the Dunn’s River Cruise so much but it had been fairly short and some of my group said they really wanted to let loose and relax. The suggestion? The Island Routes Reggae Family Catamaran Cruise. They explained that it was like The Dunn’s River Cruise, except no climbing, which my mom was happy to hear about, and a lot of time spent exploring the underwater world. Then they told me how great my timing was as they now have a brand new double decker catamaran! To be honest I couldn’t quite picture it so I didn’t know what to expect. Standing here, about to step on to the Calipsoul, I am filled with delight as the kids all leap aboard. We aren’t the only family on board that day and my group is fairly large, coming over on the shuttle service from the Beaches all-inclusive family resort I had been worried about feeling crowded. Yet, what we discover is the perfect blend of being able to find ample areas for ourselves while also having the opportunity to meet other people as equally excited as we are. The music has already started as we pull away from the dock on what is an almost unimaginably beautiful day. We choose to sit on the upper deck, after all it’s a double decker and I want to see what is different than the last time I did this. I feel a little higher up out of the water, like I’m flying. The sails are snapping in the wind and we all turn our faces into the sun as we head out to sea. The crew is doing safety checks and giving instructions and I do my own automatic check to note the location of life jackets and life saver rings on board. Although I had traveled this exact route before, I have to admit it never gets old. I can feel the thrill of being out on the open water, a strong sense of adventure and connecting to nature that you just can’t get if you stay on shore looking out at this vast expanse of shifting blues. The crew set the vibe, happily engaging with everyone as we ask our questions and people point out interesting things far out to sea as well as on shore as we are never out of sight of land. The kids opt for delicious fruit punch and we choose to do the same as we definitely want to do the snorkeling segment of this trip. One of the reasons I decided on a catamaran cruise was the fact that anyone could choose how much they wanted to participate and no one needed to be an expert at anything beyond being able to swim. We anchor in a beautiful spot just inside a reef and the crew starts to offer snorkeling lessons to anyone who hasn’t done it before. I’m surprised when my dad, mom and uncle all opt for the lesson as I had sworn they wouldn’t do it. There is something though about the enthusiasm you feel from the crew and the other passengers. My daughter tells me it’s called ‘FOMO’. Translation? ‘Fear Of Missing Out’. I think it’s the perfect way to describe it! We all get suited up as, no matter how often you’ve done this, and I’m SCUBA certified, every passenger is required to wear a life vest. I’m delighted to see that, similar to the last time I cruised with Island Routes, the Calipsoul double decker catamaran also has a slide! You sit at the top, fins forward and make a splash entrance! I admit it brings out the kid in me. Once in the water, we are directed by the crew, who have joined us, where to swim and, along the way, they make sure to point out coral formations and beautiful fish ensuring we have an amazingly immersive experience (pun intended). I explore for ages and am very excited as I brought my waterproof camera with me this time and aim to meet my self-imposed challenge of taking an underwater selfie with tropical fish. Although unsuccessful because they move pretty quickly, I still have a blast. Suddenly someone is tapping me on my shoulder and I pop my head up to see one of the crew is guiding me back to the boat. Making my way back I realize that, as strong a swimmer as I am, I’m pretty happy to have the life vest on as it allows me to keep looking under water while I make my way back without having to put in too much effort in keeping myself headed in the right direction so all my focus is on the magical world below me. We climb aboard and the teenagers head to the trampoline area (I was told that’s what it’s called). For people who may not normally hang out on a boat, this area serves an engineering purpose but is also a pretty cool area to just hang out on as it’s like a flat stretched out hammock where you can just lay out and chill. I divest myself of the fins, mask and vest and realize I’m pretty hungry! Luckily, the food comes out and everyone piles up their plates with tropical fruit, delicious wraps and chips and salsa and we head for a sunny spot on the upper deck of the catamaran. We start chatting with other people and decide it’s just about the right time for the rum version of that delicious fruit punch (after all we’re in Jamaica, how can we pass up the delicious rum and no one is driving or diving). My husband opts for a cold Red Stripe instead and leans back to work on his tan. We hear music and a lot of laughter below and realize the trampoline is empty. I decide to leave my husband happily tanning and I follow the music only to discover a full blown dance class, as the crew is teaching everyone the latest Jamaican dancehall dance moves. Although I feel a little self-conscious when I join in, that quickly fades away as everyone tries their best to match the expertise of the crew. Over on the right two little girls have their own crew member showing them what to do and they catch on quickly, delighted grins lighting up their faces. I manage to muddle through and I’m pretty sure my sister is going to show these videos to everyone once we get back home for an evening full of a similar level of laughter at my expense. In that moment though, I don’t care. I feel the salt from the sea drying on my skin, my hair is a tousled mess and I’m dancing with my children in the middle of the Caribbean Sea. This, I think, is what happiness is. For more information on Island Routes Catamaran Cruises and other excursions they offer in Jamaica and elsewhere in the Caribbean check out www.islandroutes.com and they’ll help you to book your perfect adventure today!